Robert Lanham’s writing has appeared in The New York Times, Salon, and The Washington Post. He is the author of The Hipster Handbook and The Sinner's Guide to the Evangelical Right. Pat Buchanan Says "Lesbian Coalition of America Discriminates Against White Males"
While appearing on the Rachel Maddow Show last night in the recurring segment "It's Pat," MSNBC pundit Pat Buchanan accused the Lesbian Coalition of America (LCA) of discriminating against him. "I'm as qualified as anyone to head this organization, and for them to not consider my nomination to head the executive board is reverse discrimination against white males," said Buchanan. Buchanan was nominated by the group's senior board member, Alexandra Tillman, who suffers from dementia and assumed Buchanan was a lesbian after seeing him several times on Maddow's show. The nomination was quickly blocked by a majority vote. Buchanan was outraged by the rejection. "No one is more qualified to head this lesbian group than me. I'd enliven the LCA and help them move in a new direction," wrote Buchanan in the New Republic. He talked about the LCA's decision with Maddow on MSNBC last night. "I've long felt kinship with the lesbian community," Buchanon told Maddow. "Why do you think I'm always on your show, Rachel? I pride myself in being a bit of a hag." Days earlier, Maddow and Buchanan had engaged in a very heated discussion over Supreme Court nominee Sonia Sotomayor. Buchanan insisted that Sotomayor was an unqualified affirmative action candidate and that her nomination to the Supreme Court was an affront to white working class folk. "Why is it okay to discriminate against white males?" Buchanan asked rhetorically. In what's being touted as round two of their debate, Maddow defended the LCA while accusing Buchanan of "inconsistent logic" in regard to affirmative action. "What happened to your stance that affirmative action is discriminatory?" asked Maddow. "Had your nomination been accepted by the LCA, it would have been a classic example of affirmative action for white men at play. You can't have it both ways, Pat." "Now hold on, Rachel. The differences are clear. I'm no affirmative action baby. I watch Ellen. I love The L Word. I'm the best and most qualified candidate." As tension mounted between the two MSNBC pundits, Buchanan argued that the LCA had been guilty of discrimination ever since their formation during the civil rights era. "Lesbians make up 100% of the people on their current staff, Rachel. Where are the white males? I've been to their meetings. Where are the blue collar men from Nebraska? You don't see Joe the Plumber there, Rachel. What does the Lesbian Coalition of America have against working class male folk?" asked an outraged Buchanon. 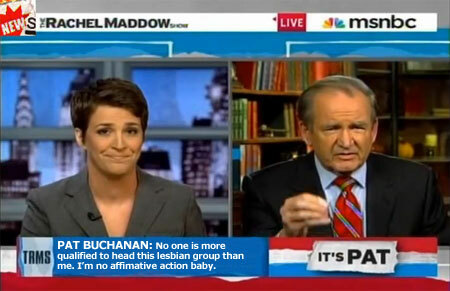 Appearing flustered, Maddow questioned Buchanan about his historic opposition to gay rights. "You oppose everything the group stands for, Pat. You're a social conservative. You started all this nonsense about the 'culture war,' for God's sake. Why would you want anything to do with this group?" she asked. "That hurts," said a visibly rattled Buchanan. "I've always supported you, haven't I Rachel? And when you and your friends in New York get together, where's my invitation? Do you think I enjoy going to dinner with McLaughlin and Eleanor Clift. I don't. I'm on this show all the time. You repay my support by shutting me out, Rachel. And the LCA has done the same thing." But as a testament to their apparent fondness for one another, cable's most unlikely duo parted on an upbeat note. "It's always a pleasure to have you on, Pat," said Maddow, after apologizing for not spending more time with 70-year-old pundit. "I've enjoyed it as I always do, Rachel," said Buchanan. "But next time you have a BBQ, maybe invite me and some of my male, white, working class friends to that."